Hi everybody! It's been busy around here! Firstly - big announcement - I now have dozens of gorgeous "allover print" T-shirts available at People's Choice Apparel here - and they will be adding more this week, including more men's designs, etc. They are high quality, amazing printing, and gorgeous. And in other news - I'm working on two new Disney pieces! One is a new Tinker Bell for my Disneyland WonderGround Gallery "Take over" event in July (details here) and the other is a Snow White painting that will be for Disney's D23 Convention (details about the convention are here, more info to come). 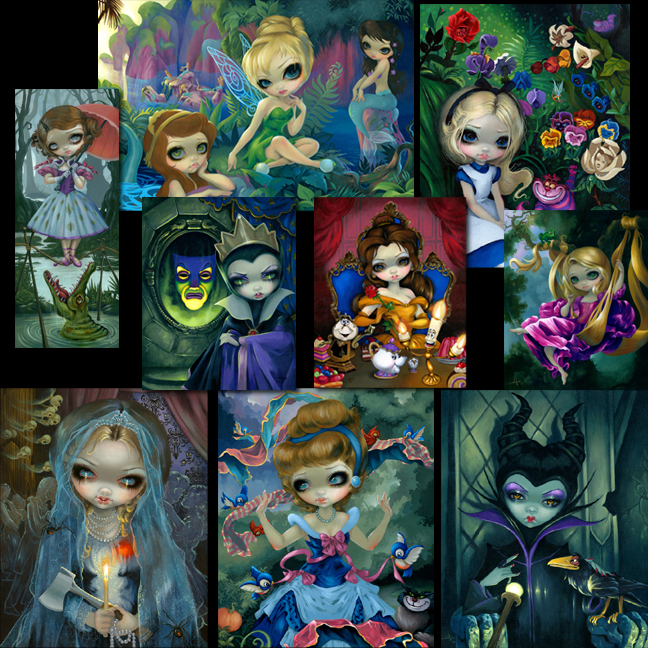 Because of all the Disney "buzz" I have also written up a comprehensive guide on how/where you can purchase my Disney artwork & merchandise, and have included that info at the bottom of this update. 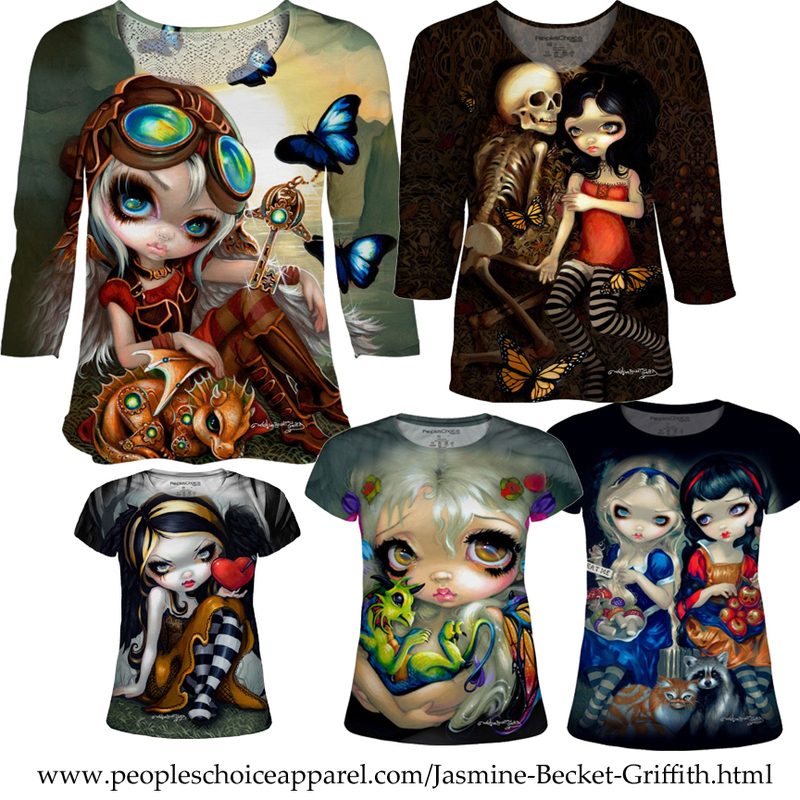 These are awesome - "allover print" shirts - just got mine in them ail and they are GORGEOUS, high quality, I love them. These just came out this week and there are new images & designs popping up everyday! Yesterday they have started new Men's shirts (and they're working on some more "manly" designs for you guys this next week) - there are Juniors, Womens, dolman, 3/4 sleeves, cap sleeves, all sorts of options, sizes SM through 3X. Be sure to look at each style of shirt and scroll down to see the exact measurements. Click here to see the current shirts. Be sure to bookmark & check later to see new styles & images! 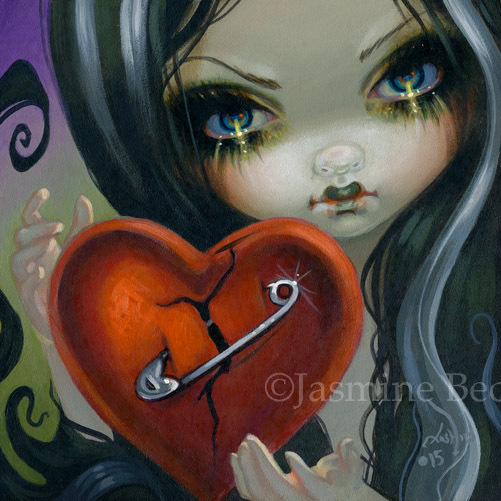 Every year, I try to do a new little Valentine's fairy, and here is the original painting for 2015. This cutie has a Valentine hear that has been broken..... but mended, with a safety pin (hey, why not?). Glossy paper prints are on sale for $9.99 this week (signed on the back by me) and limited edition canvas prints for $75 (also 6x6", hand embellished, signed & numbered out of 25). 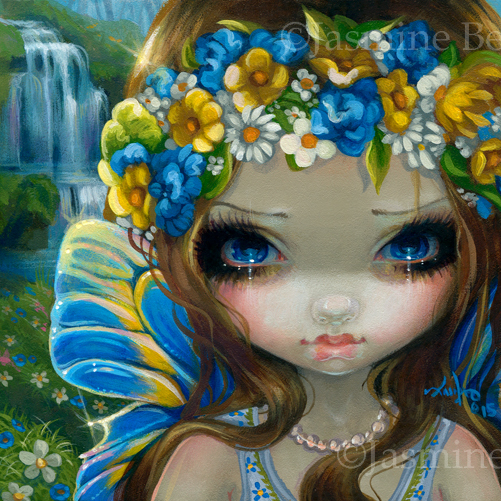 I finished the custom Faces of Faery I'd been working on - and you can see her & grab prints of her here. She is called Faces of Faery #229 and is 6"x6" square, acrylic on panel ($1600 SOLD) - we have prints for $9.99 this week and limited edition canvas prints for $75 (all are also 6x6"). Swedish themed, this little beauty was painted to the client's specifications with a blue & yellow Midsummer flower wreath in her hair! 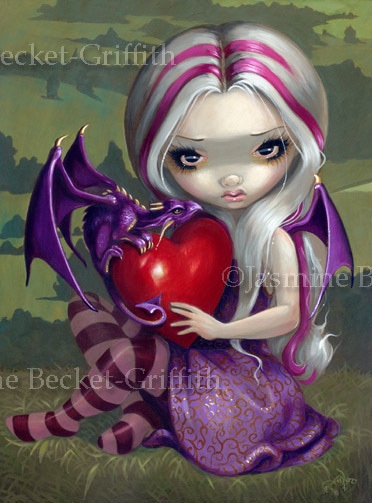 Our sale print of the week is "Valentine Dragon" - right here! Open edition prints ($9.99-$19.99) & OE Canvas Prints $90 for this week only! We've decided this year to do a weekly "sale print" of some of my personal favourites and this week it's Valentine Dragon. Keep an eye up at Strangeling.com each week to see what's on sale. Open edition glossy paper prints are signed by me on the back, Open Edition 12x16 Canvas prints are gallery wrapped on boards, remarqued in metallic ink on the front, and come with a signed Certificate of Authenticity (the Limited Edition Canvases have long since sold out, but the Open Edition Canvases are still available). Click here to see her on sale! A lot of you have been asking where to get my Disney artwork, so I thought I'd better make a good & informative post about it smile emoticon Please read this whole post before asking questions, your answer will probably be in this caption already! These are not my listings! These are listings from dozens, hundreds of different eBay sellers (mostly Disney merchandise resellers, locals, passholders, Disney castmembers, or other people with access to Disney Parks merchandise & artwork), and I updated it regularly so that you can see all of the official Disney merchandise featuring my artwork all gathered together on eBay! Be sure to follow & bookmark that collection at the link here. Every seller has different policies, but many are happy to ship worldwide. you can always find this same information on Strangeling.com - I update there everytime I have Disney artwork.